Afsharpaiman, S., Izadi, M., Ajudani, R., Khosravi, M. (2016). Pleural Effusion in Children: A Review Article and Literature Review. 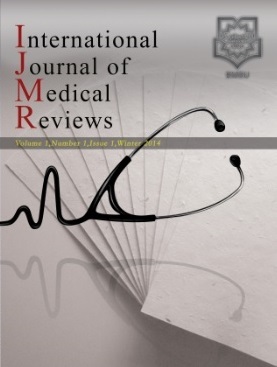 International Journal of Medical Reviews, 3(1), 365-370. Shahla Afsharpaiman; Morteza Izadi; Reza Ajudani; Mohammad Hossein Khosravi. "Pleural Effusion in Children: A Review Article and Literature Review". International Journal of Medical Reviews, 3, 1, 2016, 365-370. Afsharpaiman, S., Izadi, M., Ajudani, R., Khosravi, M. (2016). 'Pleural Effusion in Children: A Review Article and Literature Review', International Journal of Medical Reviews, 3(1), pp. 365-370. Afsharpaiman, S., Izadi, M., Ajudani, R., Khosravi, M. Pleural Effusion in Children: A Review Article and Literature Review. International Journal of Medical Reviews, 2016; 3(1): 365-370. Pediatrics pleural effusion is an abnormality that frequently develops from collection of fluids in the pleural space and commonly caused by a primary phenomenon or secondary to variety of disorders such as infections. This accumulated fluid can be originated from excessive filtration or defective absorption caused by different infectious agents such as Streptococcus pneumoniae, which is the most common, or non-infectious factors like lymphoma or congestive heart failure. It may present a various range of complications from a self-limited one to respiratory failure. Pediatrics pleural effusion is most commonly seen in boys and younger children. The incidence and distribution of pleural effusion is increasing in most industrial countries according to the population studies. The prognosis is highly related to the underlying disorder as well as treatment approach. early drainage of fluid may dramatically reduce the rate of mortality and morbidity. in favorable outcomes and significantly reduces morbidity and mortality rates. Wang NS. Anatomy of the pleura. Clin Chest Med. Jun 1998;19(2):229-40. [Medline]. Agostoni E, Zocchi L. Mechanical coupling and liquid exchanges in the pleural space. Clin Chest Med. Jun 1998;19(2):241-60. [Medline]. Alkrinawi S, Chernick V. Pleural infection in children. Semin Respir Infect. Sep 1996;11(3):148-54. [Medline]. Le Monnier A, Carbonnelle E, Zahar JR, et al. Microbiological diagnosis of empyema in children: comparative evaluations by culture, polymerase chain reaction, and pneumococcal antigen detection in pleural fluids. Clin Infect Dis. Apr 15 2006;42(8):1135-40. [Medline]. Saglani S, Harris KA, Wallis C, Hartley JC. Empyema: the use of broad range 16S rDNA PCR for pathogen detection. Arch Dis Child. Jan 2005;90(1):70-3. [Medline]. Buckingham SC, King MD, Miller ML. Incidence and etiologies of complicated parapneumonic effusions in children, 1996 to 2001. Pediatr Infect Dis J. Jun 2003;22(6):499-504. [Medline]. Quintero DR, Fan LL. Approach to pleural effusions and empyemas. Paediatr Respir Rev. 2004;5 Suppl A:S151-2. [Medline]. Hausdorff WP, Feikin DR, Klugman KP. Epidemiological differences among pneumococcal serotypes. Lancet Infect Dis. Feb 2005;5(2):83-93. [Medline]. Byington CL, Korgenski K, Daly J, Ampofo K, Pavia A, Mason EO. Impact of the pneumococcal conjugate vaccine on pneumococcal parapneumonic empyema. Pediatr Infect Dis J. Mar 2006;25(3):250-4. [Medline]. Eltringham G, Kearns A, Freeman R, et al. Culture-negative childhood empyema is usually due to penicillin-sensitive Streptococcus pneumoniae capsular serotype 1. J Clin Microbiol. Jan 2003;41(1):521-2. [Medline]. Obando I, Munoz-Almagro C, Arroyo LA, et al. Pediatric parapneumonic empyema, Spain. Emerg Infect Dis. Sep 2008;14(9):1390-7. [Medline]. Schultz KD, Fan LL, Pinsky J, et al. The changing face of pleural empyemas in children: epidemiology and management. Pediatrics. Jun 2004;113(6):1735-40. [Medline]. Bryant RE, Salmon CJ. Pleural empyema. Clin Infect Dis. May 1996;22(5):747-62; quiz 763-4. [Medline]. Brook I. Microbiology of empyema in children and adolescents. Pediatrics. May 1990;85(5):722-6. [Medline]. Merino JM, Carpintero I, Alvarez T, et al. Tuberculous pleural effusion in children. Chest. Jan 1999;115(1):26-30. [Medline]. Kim HJ, Lee HJ, Kwon SY, et al. The prevalence of pulmonary parenchymal tuberculosis in patients with tuberculous pleuritis. Chest. May 2006; 129(5):1253-8. [Medline]. Panitch HB, Papastamelos C, Schidlow DV. Abnormalities of the pleural space. In: Taussig LM, Landau LI, eds. Pediatric Respiratory Medicine. 1999:1178-96. Munoz-Almagro C, Jordan I, Gene A, et al. Emergence of invasive pneumococcal disease caused by nonvaccine serotypes in the era of 7-valent conjugate vaccine. Clin Infect Dis. Jan 15 2008;46(2):174-82. [Medline]. Chonmaitree T, Powell KR. Parapneumonic pleural effusion and empyema in children. Review of a 19-year experience, 1962-1980. Clin Pediatr (Phila). Jun 1983;22(6):414-9. [Medline]. Mocelin HT, Fischer GB. Epidemiology, presentation and treatment of pleural effusion. Paediatr Respir Rev. Dec 2002;3(4):292-7. [Medline]. Li ST, Tancredi DJ. Empyema hospitalizations increased in US children despite pneumococcal conjugate vaccine. Pediatrics. Jan 2010;125(1):26-33. Desrumaux A, Francois P, Pascal C, et al. [Epidemiology and clinical characteristics of childhood parapneumonic empyemas]. Arch Pediatr. Nov 2007;14(11):1298-303. [Medline]. Avansino JR, Goldman B, Sawin RS, Flum DR. Primary operative versus nonoperative therapy for pediatric empyema: a meta-analysis. Pediatrics. Jun 2005;115(6):1652-9. [Medline]. Wilson, AG. Pleura and pleural disorders. In: Armstrong P, Wilson AG, Dee P, et al,. Imaging of diseases of the chest. London: Mosby; 1995:641-716. Kelbel C, Borner N, Schadmand S, et al. [Diagnosis of pleural effusions and atelectases: sonography and radiology compared]. Rofo. Feb 1991;154(2):159-63. Wolek R, Mason BJ, Reeser P, Zins JH. Pleural fluid: accuracy of computed tomography in differentiating exudates from transudates. Conn Med. May 1998;62(5):259-65. [Medline]. Aquino SL, Webb WR, Gushiken BJ. Pleural exudates and transudates: diagnosis with contrast-enhanced CT. Radiology. Sep 1994;192(3):803-8. [Medline]. Arenas-Jimenez J, Alonso-Charterina S, Sanchez-Paya J, et al. Evaluation of CT findings for diagnosis of pleural effusions. Eur Radiol. 2000;10(4):681-90. [Medline]. Donnelly LF, Klosterman LA. CT appearance of parapneumonic effusions in children: findings are not specific for empyema. AJR Am J Roentgenol. Jul 1997;169(1):179-82. [Medline]. Jaffe A, Calder AD, Owens CM, Stanojevic S, Sonnappa S. Role of routine computed tomography in paediatric pleural empyema. Thorax. Oct 2008;63(10):897-902. [Medline]. Calder A, Owens CM. Imaging of parapneumonic pleural effusions and empyema in children. Pediatr Radiol. Jun 2009;39(6):527-37. [Medline]. Ampofo K, Byrington C. Management of Parapneumonic Empyema. Pediatr infec Dis J. 2007;26:445-446. Lazarus AA, McKay S, Gilbert R. Pleural tuberculosis. Dis Mon. Jan 2007;53(1):16-21. [Medline]. Pietsch JB, Whitlock JA, Ford C, Kinney MC. Management of pleural effusions in children with malignant lymphoma. J Pediatr Surg. Apr 1999;34(4):635-8. [Medline]. Forbes BA. Critical assessment of gene amplification approaches on the diagnosis of tuberculosis. Immunol Invest. Jan-Feb 1997;26(1-2):105-16. [Medline]. Jaffe A, Balfour-Lynn IM. Management of empyema in children. Pediatr Pulmonol. Aug 2005;40(2):148-56. [Medline]. Kaplan SL, Mason EO Jr, Wald ER, et al. Decrease of invasive pneumococcal infections in children among 8 children'shospitals in the United States after the introduction of the 7-valent pneumococcal conjugate vaccine. Pediatrics. Mar 2004;113(3 Pt 1):443-9. [Medline]. Poehling KA, Talbot TR, Griffin MR, et al. Invasive pneumococcal disease among infants before and after introduction of pneumococcal conjugate vaccine. JAMA. Apr 12 2006;295(14):1668-74. [Medline]. Li ST, Tancredi DJ. Empyema Hospitalizations Increased in US Children Despite Pneumococcal Conjugate Vaccine. Pediatrics. Nov 30 2009;[Medline].